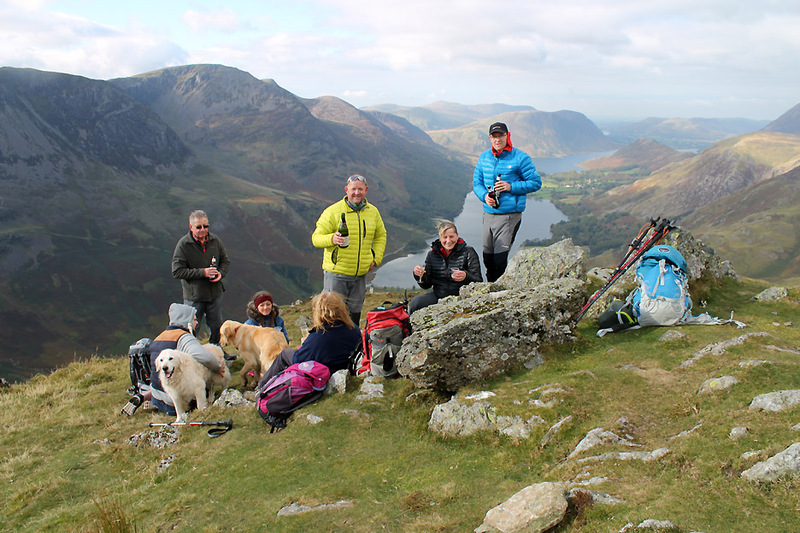 " Mark's 214 on Fleetwith Pike "
Date & start time: Saturday 17th October 2015, 12.40 pm start. 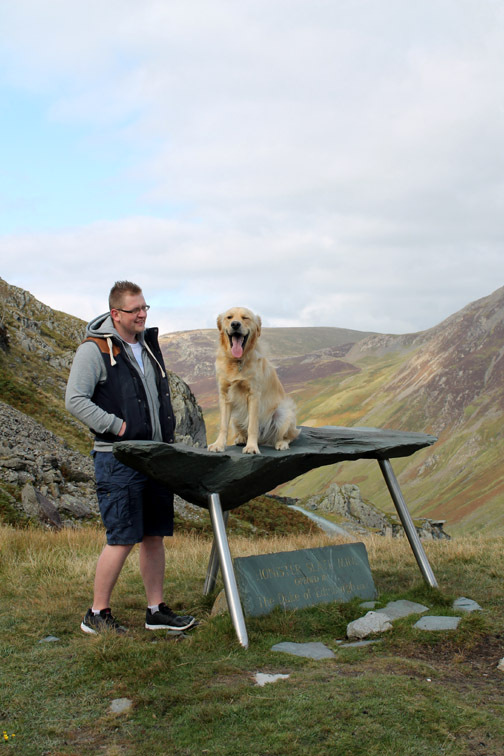 Places visited : Bell Crags, Black Star, Fleetwith Pike, Dubbs Hut and the Drum Road. 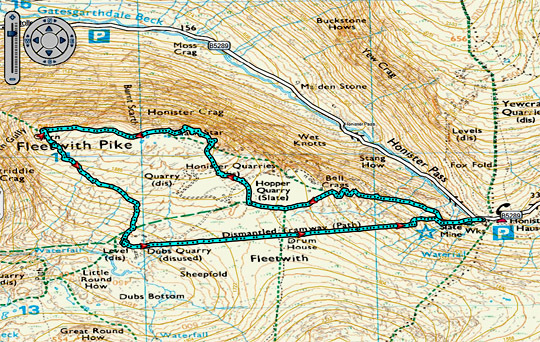 Walk details : 3.9 mls, 1320 ft of ascent, 3 hours 35 mins including lunch at the summit. 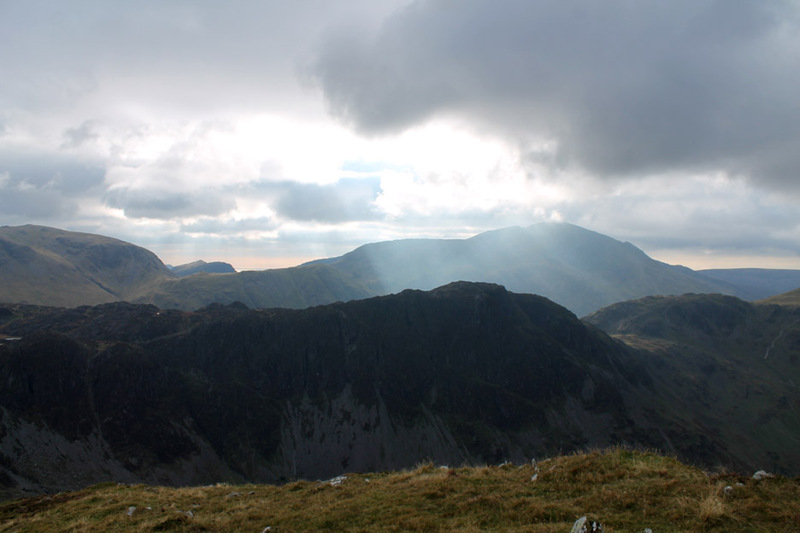 Highest point : Fleetwith Pike, 2126 ft, 648 metres. 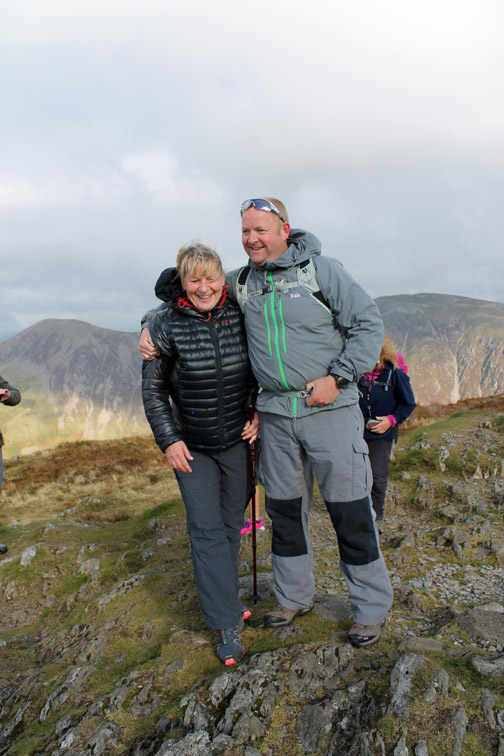 Walked with : Mark and Gill, Raymond (Mark's Dad), Nathan (Mark's son) and Charlotte, Alex, (Mark's son-in-law) Ann and myself (just good friends ... of Mark) plus our dogs, Harry and Dylan. Weather : Sunshine and clouds but turning overcast later. Fair breeze on the summit. 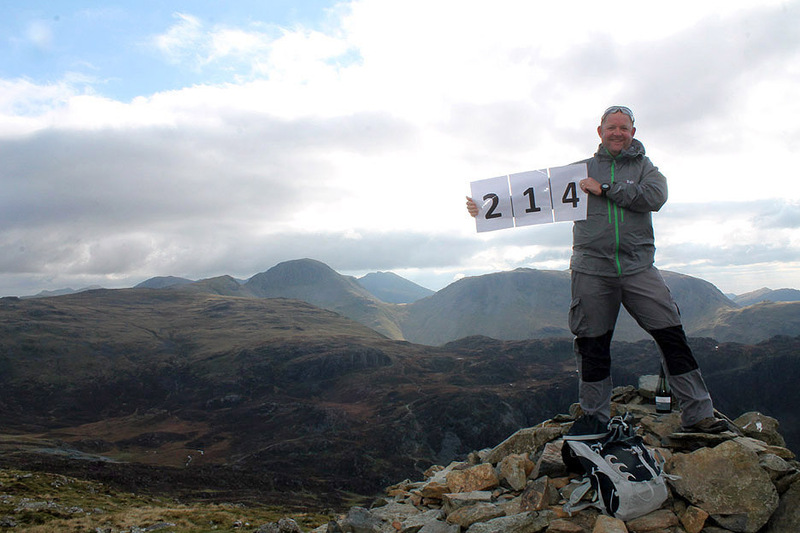 as a culmination of five years of Mark's walking all the 214 Wainwright summits of the Lake District. 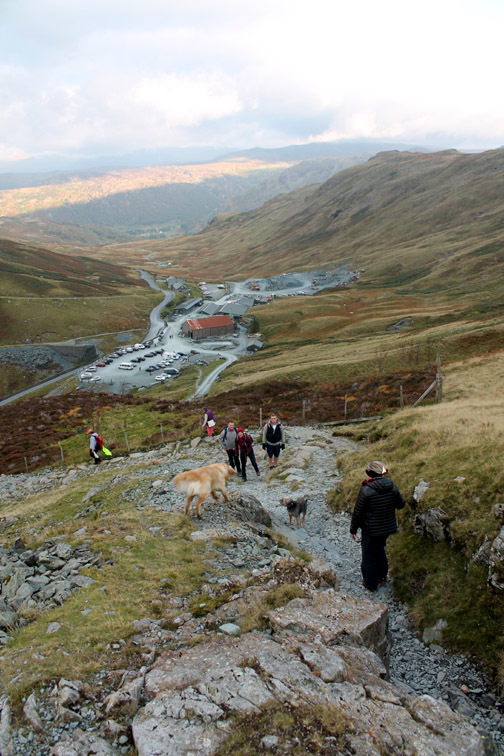 The day is fine, the time is right and we head up to Honister to meet them in the car park. 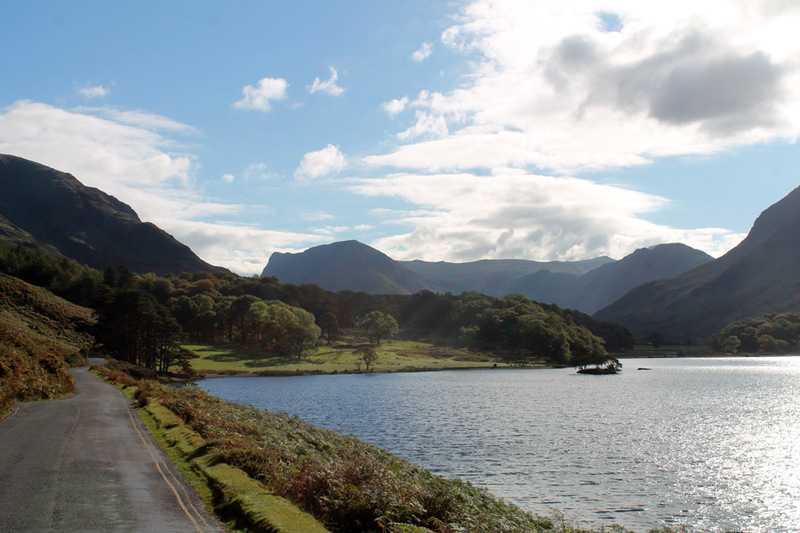 Heading up the Buttermere Valley. 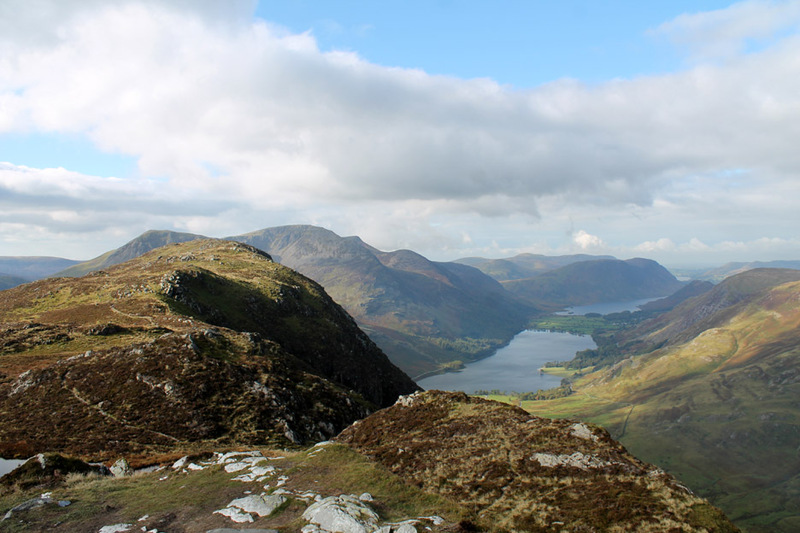 Fleetwith Pike stands proud at the head, along with Haystacks, AW's final resting place. Crowd Scene . 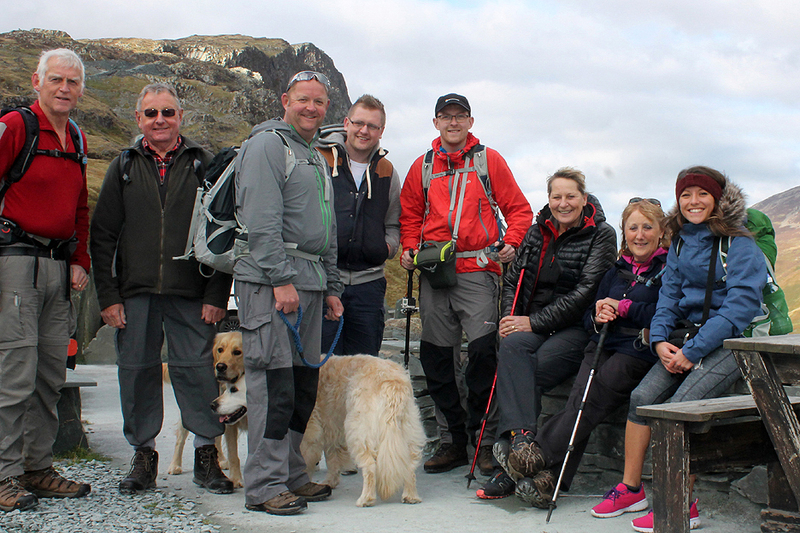 . . a full group photo at the Honister car park before the start of the walk. As a slight digression at this early stage . . .
who had just returned home after a recent visit. plus the closest they had to a modern equivalent. The first sign pointed out the steep hill . . . this second sign was a sort of reminder ! The same hill this year . . . minus the old signs. 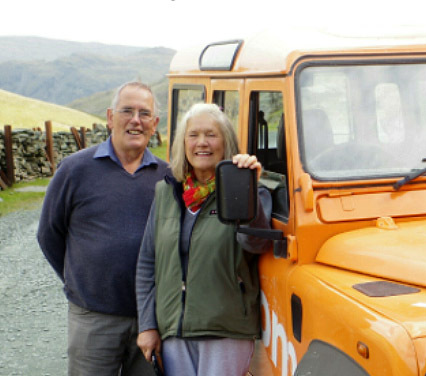 This is the hill up from Buttermere that we had just driven up in order to meet up with Mark and Gill. 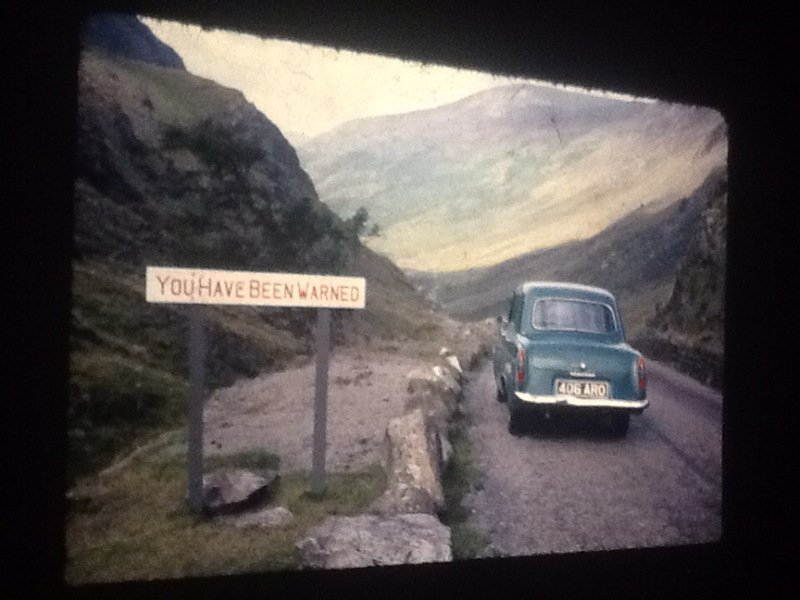 Just had to say that the road sign before "You have been warned" on Honister Pass didn't give gradient details. It simply said "Cyclists dismount" ! I remember it well (1956 was the first time) but I didn't do as I was told ..... so down the pass in record time! 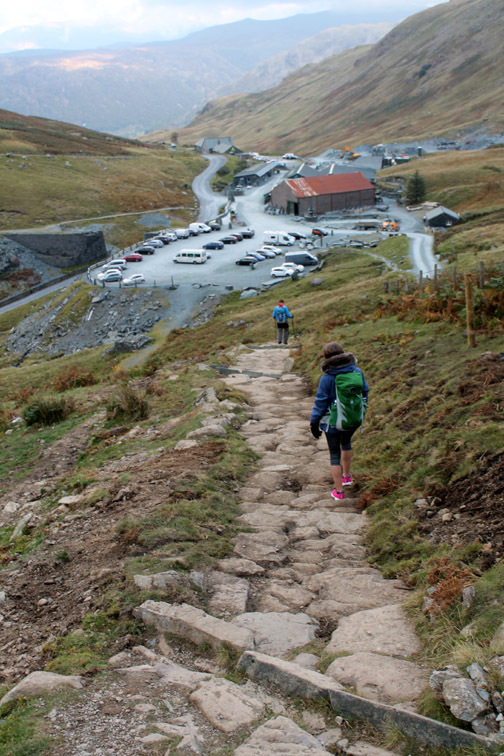 Another cyclist who ignored the warning signs on Honister's downward tracking for 'Cyclist' to dismount. Mine was a bit earlier than '56, obviously she survived the bridge stream crossing half way down. drinking a bottle of Jennings lemonade. Too young for any thing else. 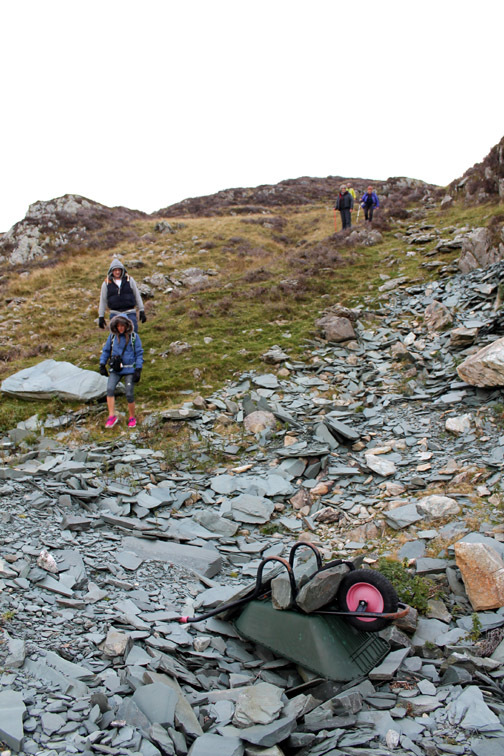 Underway now, and we take the mine track out of the car park. We stood aside a couple of times to let the single decker bus take visitors up to climb the Via Ferratas. Happy faces . . . starting the steep ascent. 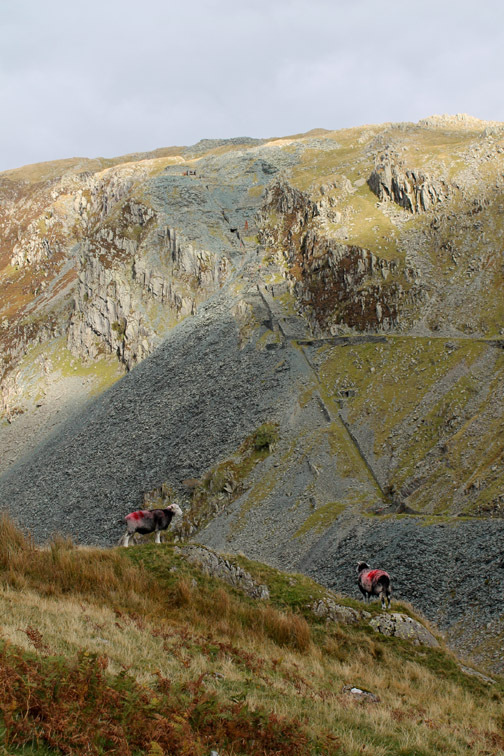 Across the way are the old Yew Crag Quarries. There's an extra item on the memorial today.
" 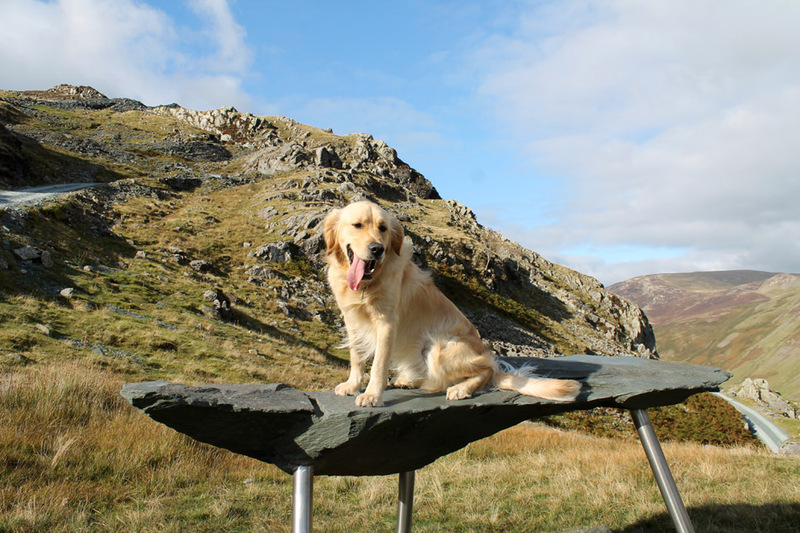 Pleased as Punch "
When our backs were turned, Dylan had taken it upon himself to jump up onto the slate table. It made such a nice picture that I lifted Harry up to join him on the table. 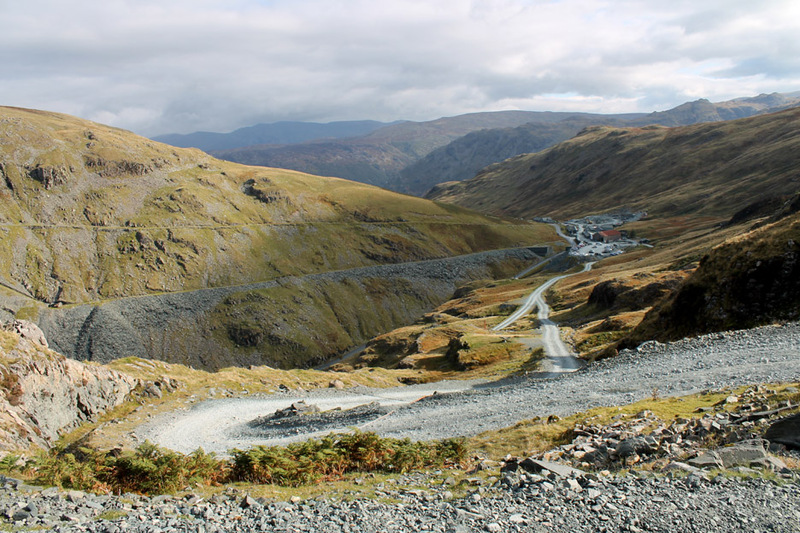 and where the gradient is too much, the road does a series of hairpin bends to gain height. Near the top the gradient levels out and we re-group, ready to leave the road on the path to the summit. 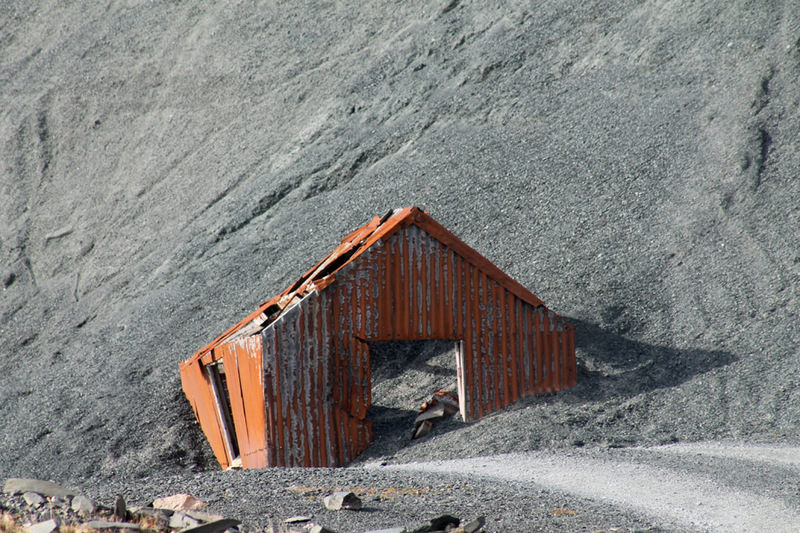 The old quarry shed has seen better days. 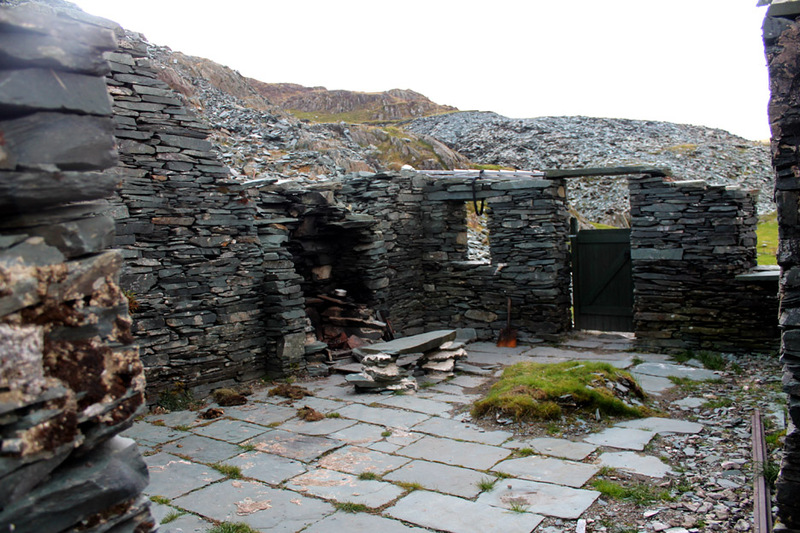 The stone tip is comprised of slate chippings . . . suitable for road-stone, drainage infill or for garden paths and driveways. 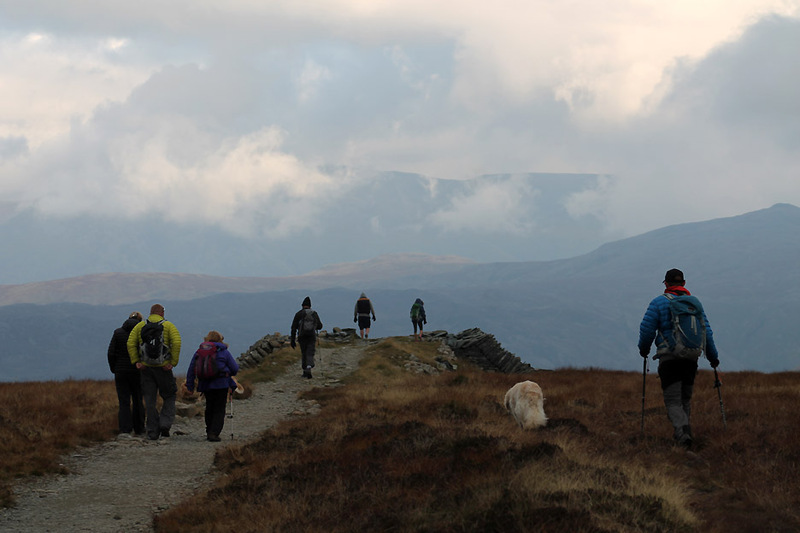 Raymond leads our group out onto the fell . . . we are heading for the summit of Black Star first. 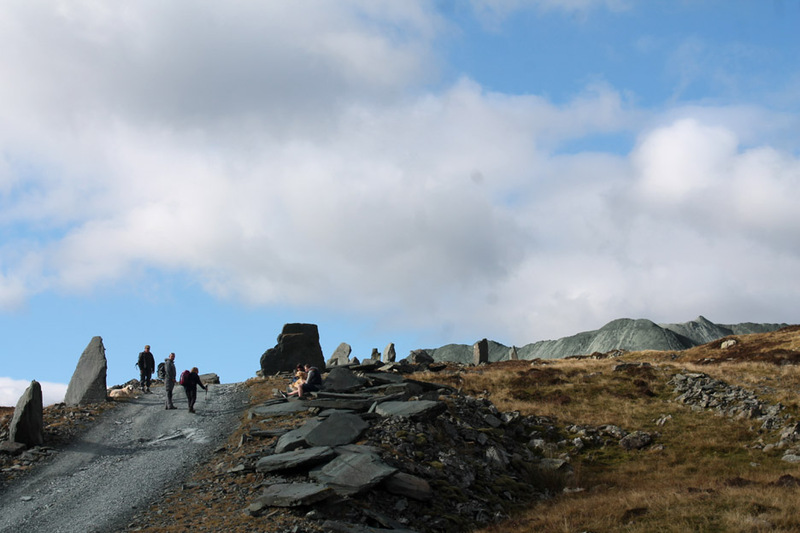 Alex looks down on the top of the old Ash Crag Quarries. Round the corner . 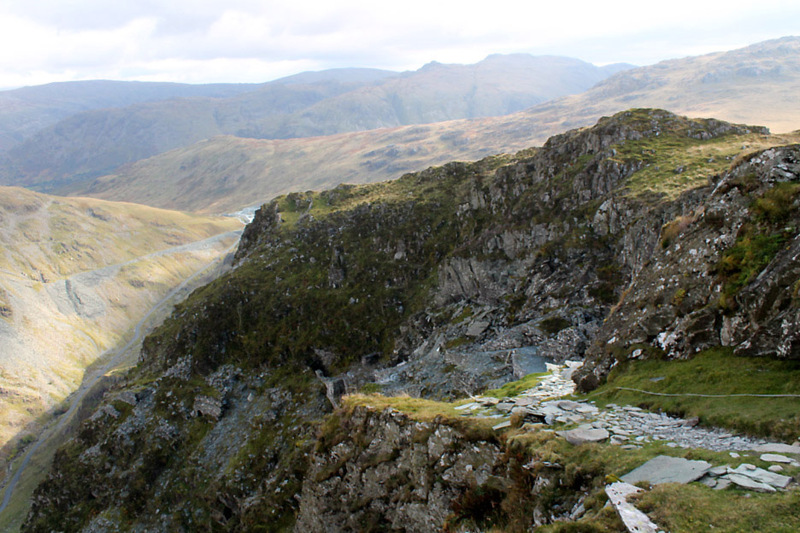 . . the end of the Via Ferrata cable . 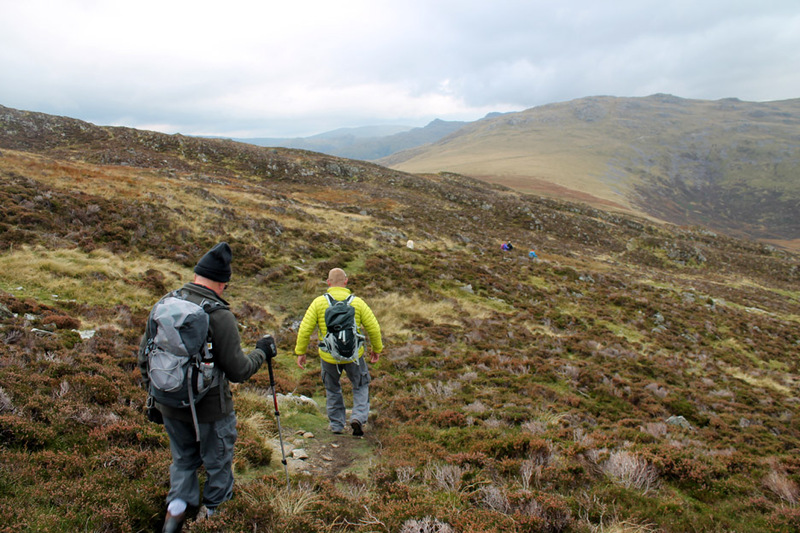 . . the end of the climb up the face of the crags. Over to Black Star summit and we pause while another photographer takes his shot. 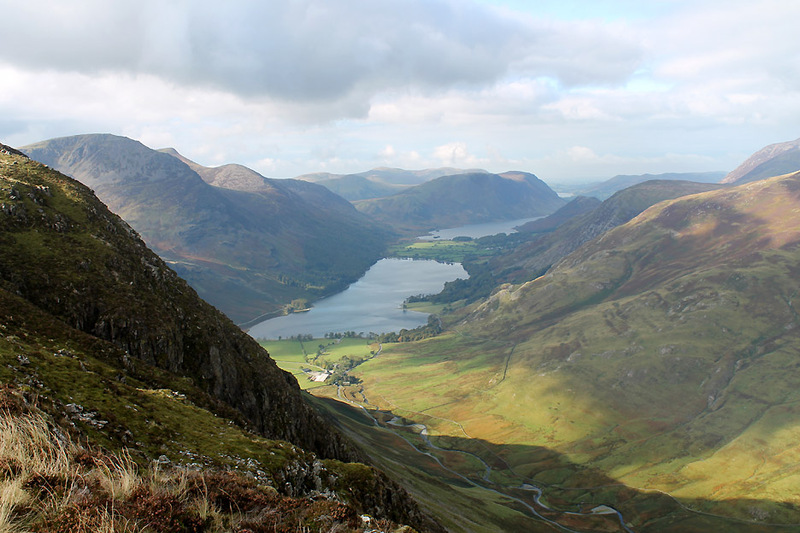 Our view down the Buttermere Valley from Black Star summit. 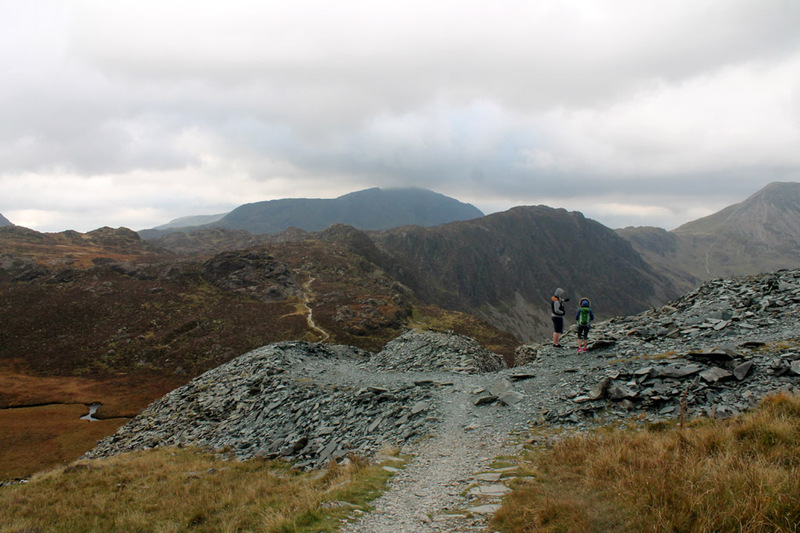 Walking the ridge towards Fleetwith Pike now . 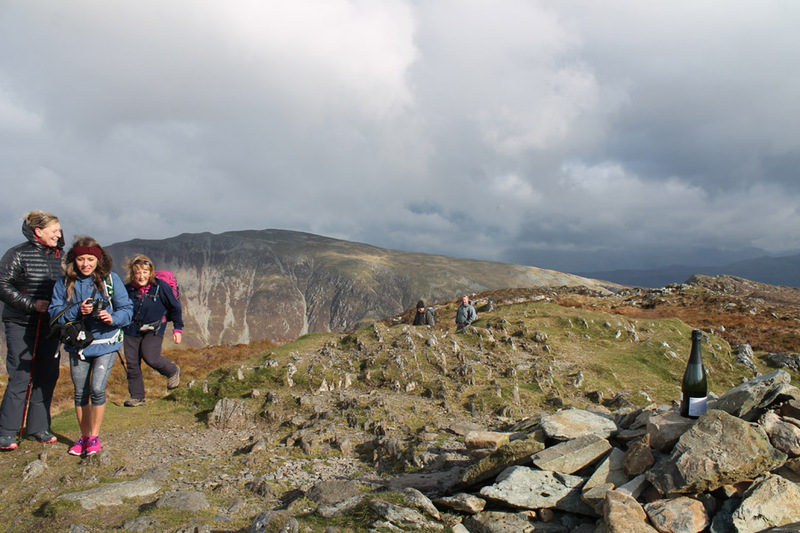 . . that's Great Gable in the background. 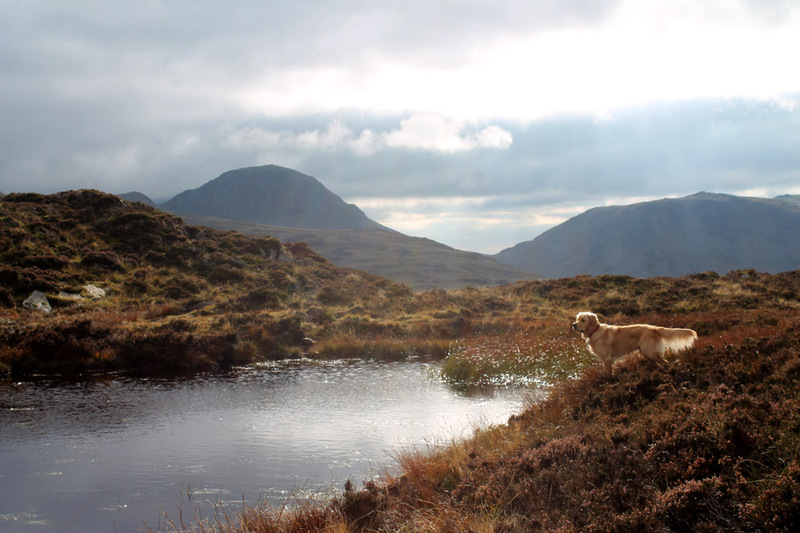 There are several pools along the way but the dogs stay remarkably dry for some reason. 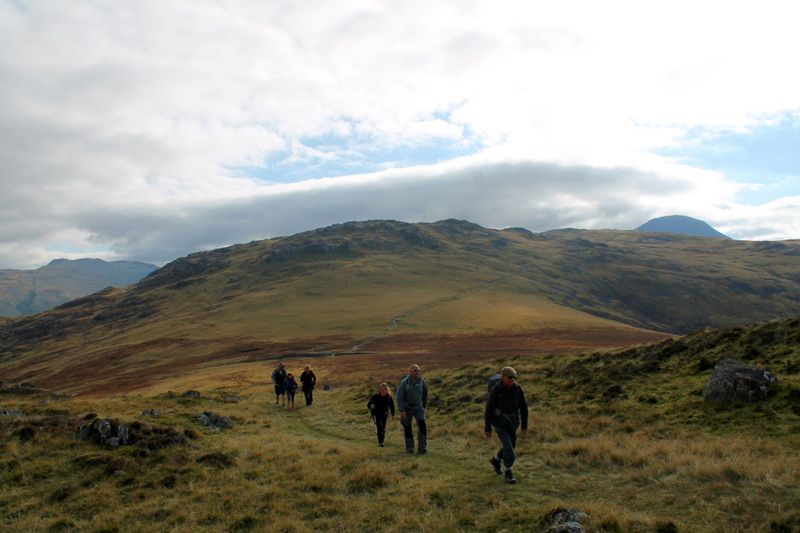 The weather is great and the views have 'come up trumps' for Mark's final 214 walk. 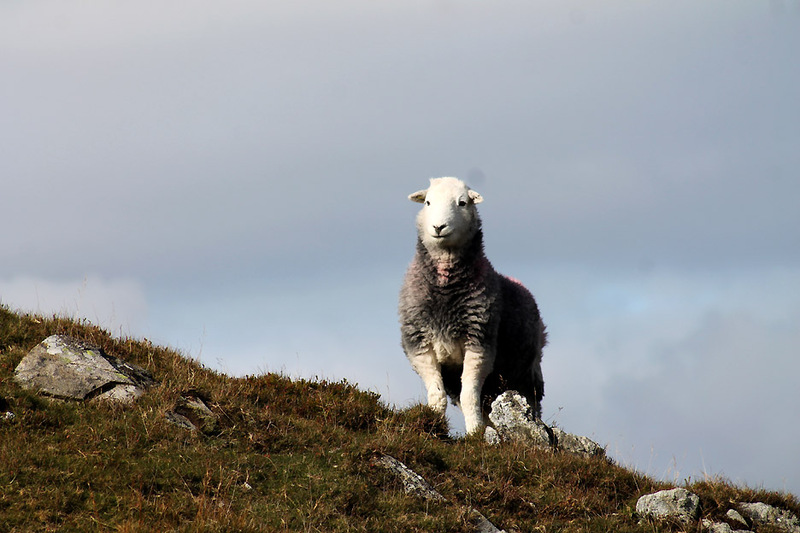 A local Herdwick looks on as we pass . . . " What's going on today then . . . something special ?"
. 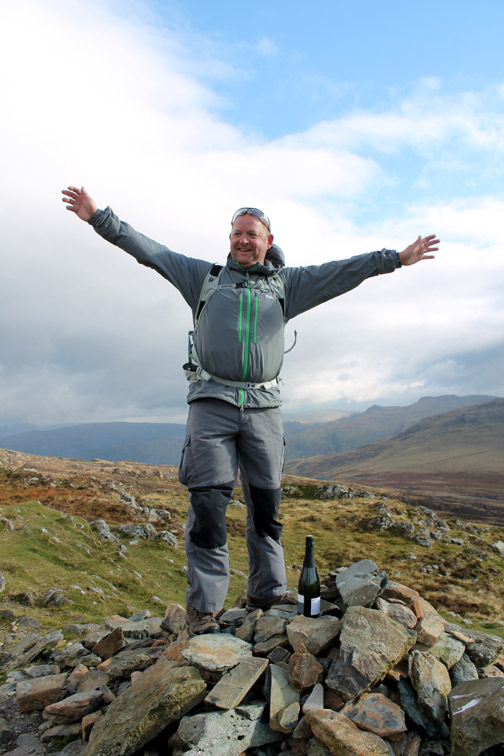 . . because there's a bottle waiting on the summit cairn !
. . . he's just delighted at having completed the round. From his pack he produced a computer and printer and runs off a poster. Only joking . . . this was one he made earlier . . . he must have been confident of getting here. 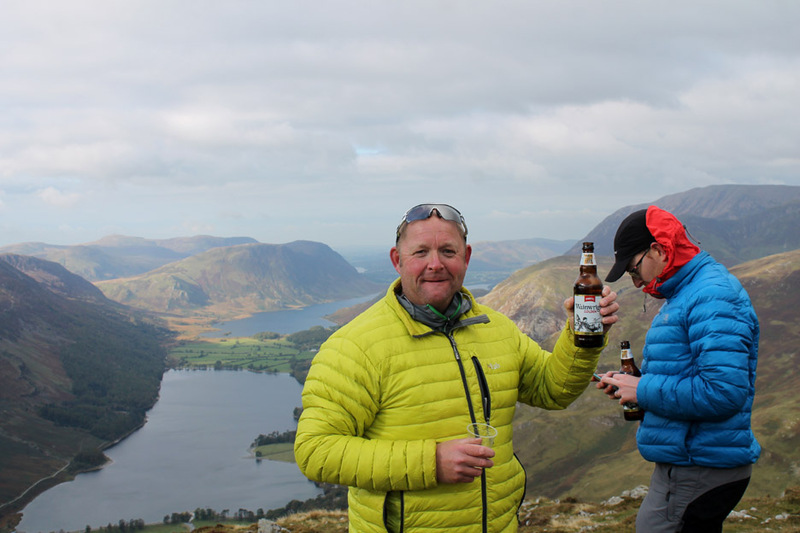 Cracking open a classic bottle of Wainwright Ale . . . or two. Time for some serious celebrations. 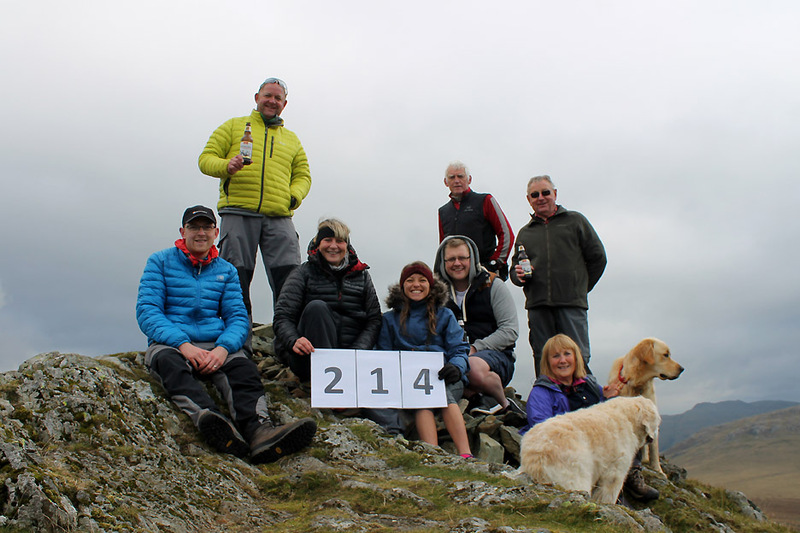 This was Mark's 214th fell and Raymond's first . . . he seems to be enjoying it too. Summit photo . . . courtesy of the self timer and Alex's tripod. 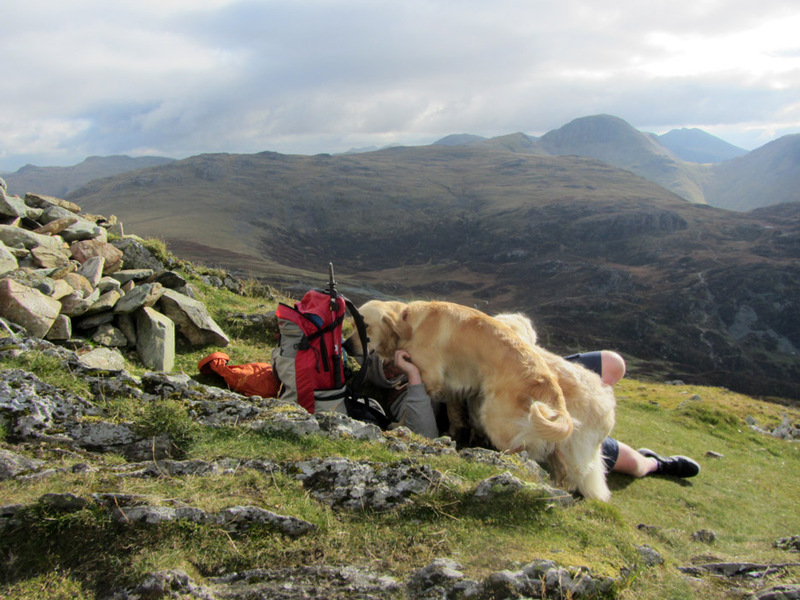 A spot of lunch is called for so Nathan lies in the shelter of the summit cairn. Good try . . . but one major problem. A second rock hollow a little further down offers greater respite from the cool breeze. 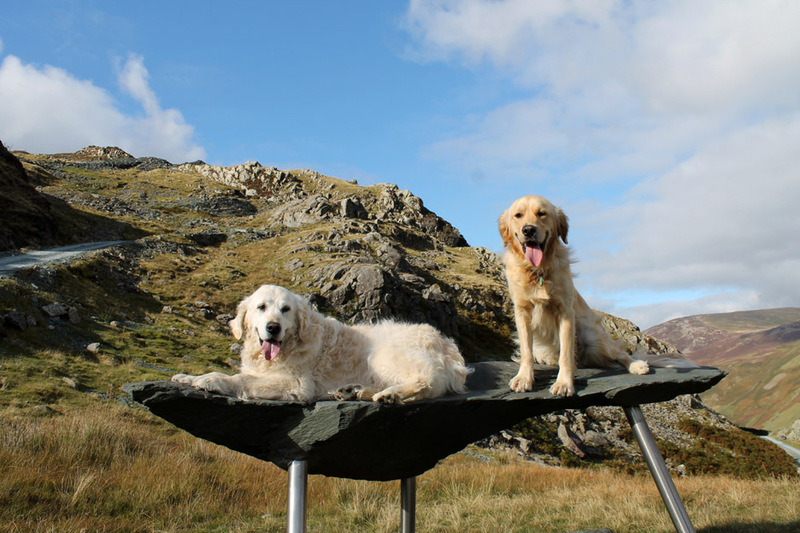 Over lunch we have chance to look around at all the fells that Mark has climbed in the last five years. 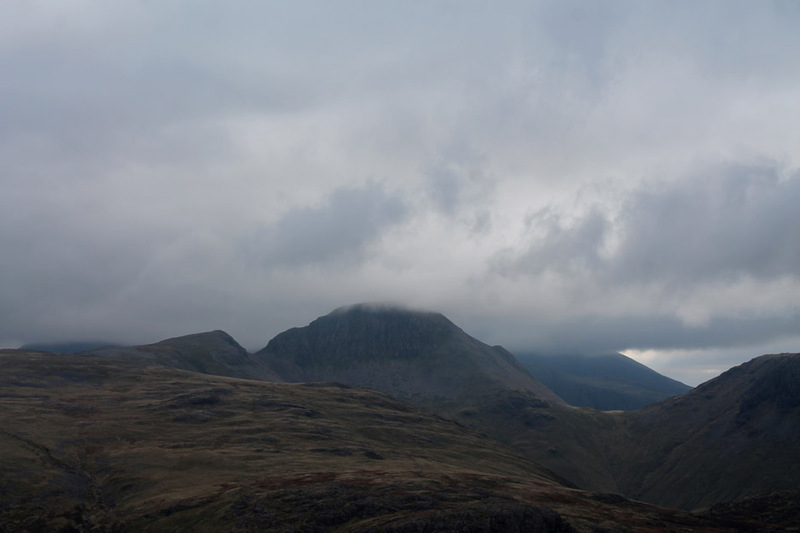 The cloud base is lowering slightly and Great Gable is losing its top. 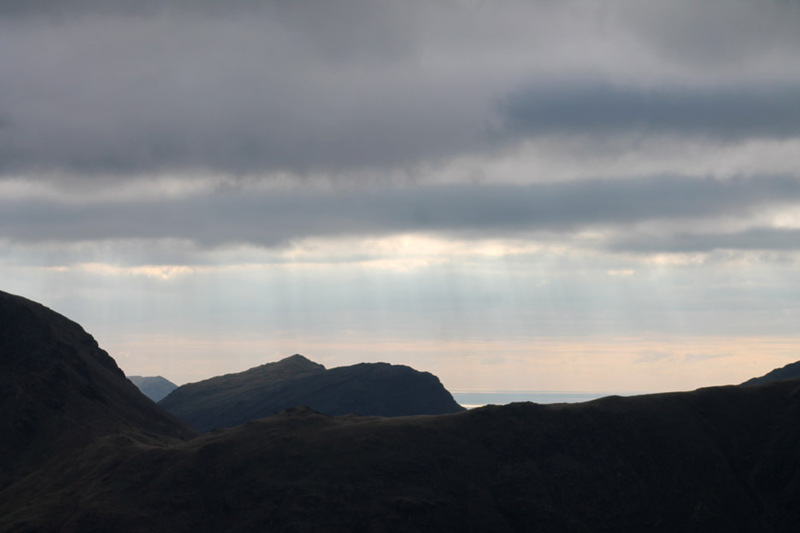 The cloud is not that thick and a burst of sunlight brightens Ennerdale Valley and Pillar. Raymond asks what's through the gap . 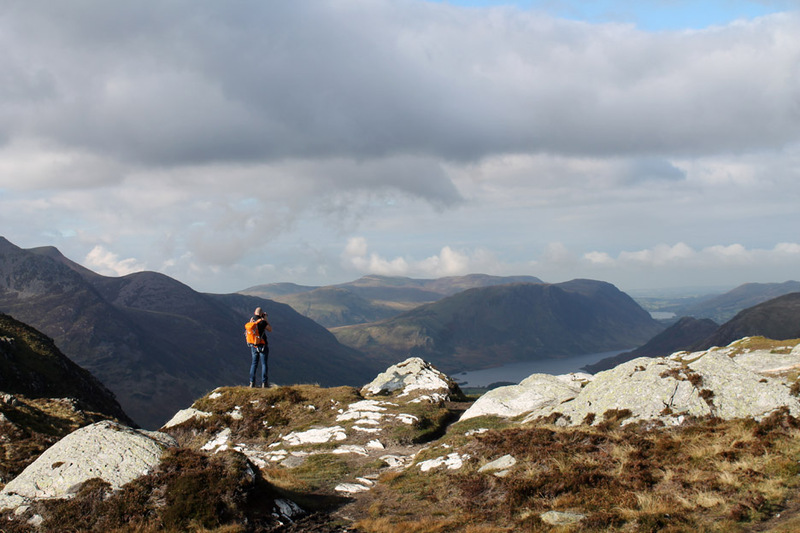 . . that's Yewbarrow and the Irish Sea beyond. 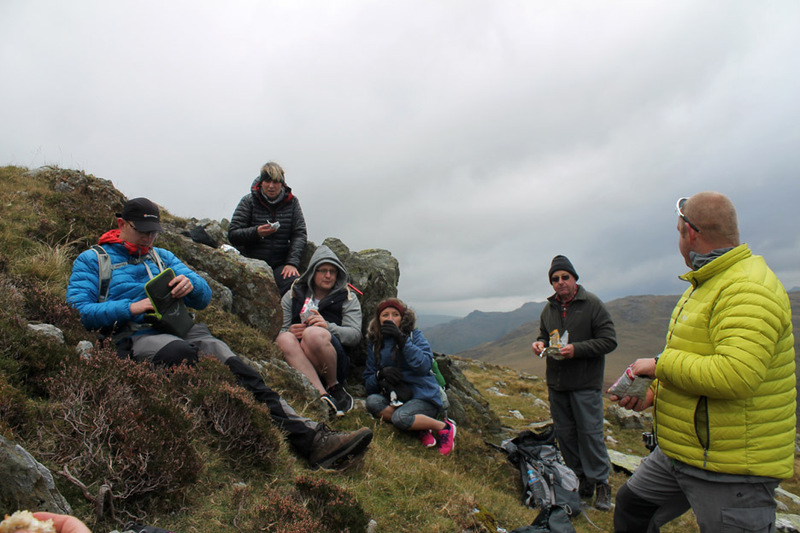 Suitably fortified, we make our way down towards Dubs Hut. so our route will be a simple one today. No first summit of a 2nd round for Mark. 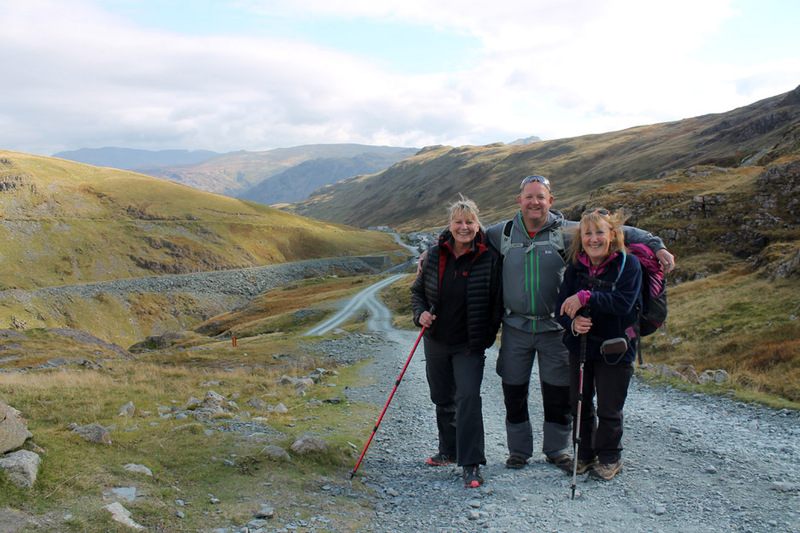 We'll all head back to Honister. we found a new looking wheel barrow. It had been well secured by chaining a few boulders onto it. The answer came once we rounded the corner . 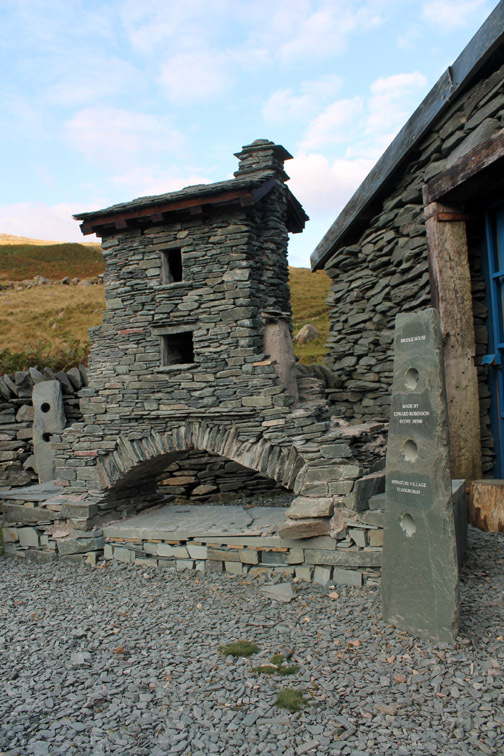 . . the workmen have been renovating the bothy. The roof and windows have been repaired . 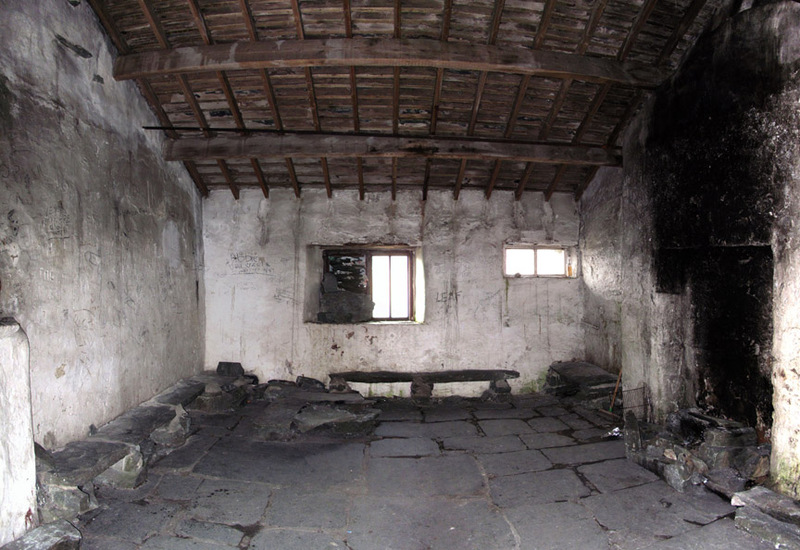 . . and there's a outside fireplace with a newly cemented seat. We take a look inside . . . 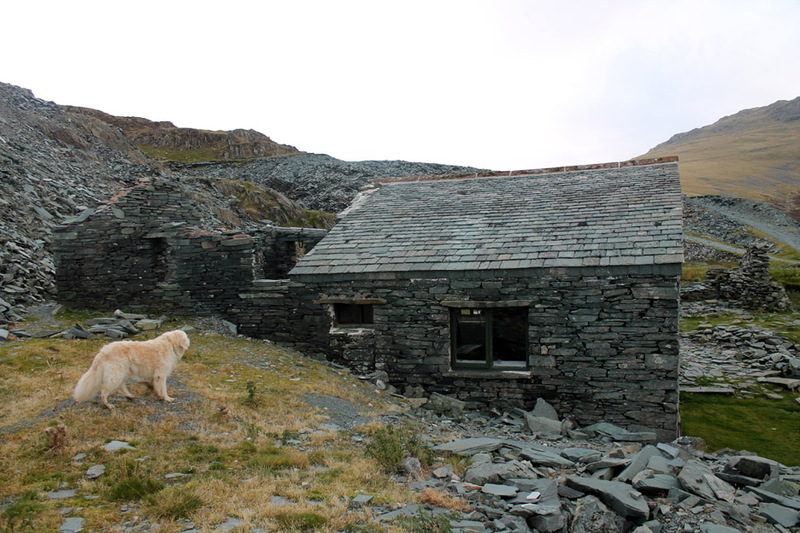 In recent years the bothy has become rather run down . . . this is what it looked like last time we were in. Today there is a huge transformation. 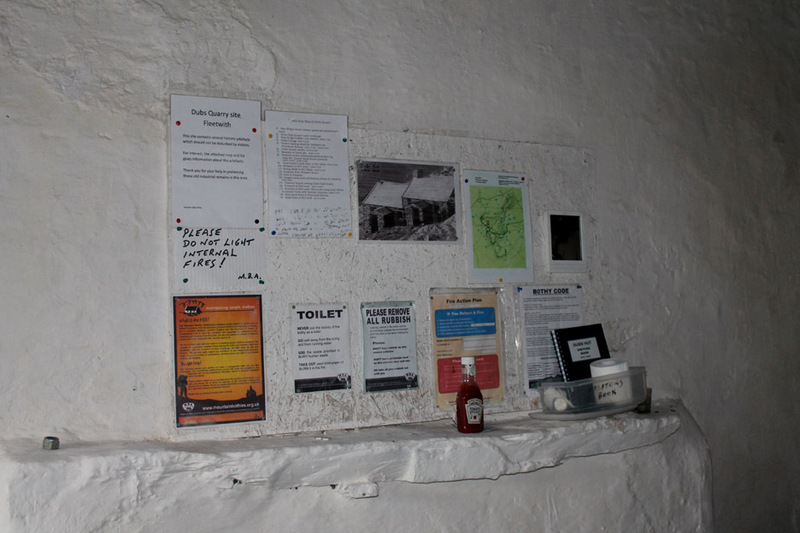 It is newly painted and furnished with camp beds and a notice board. and looked after in the way it deserves to be. 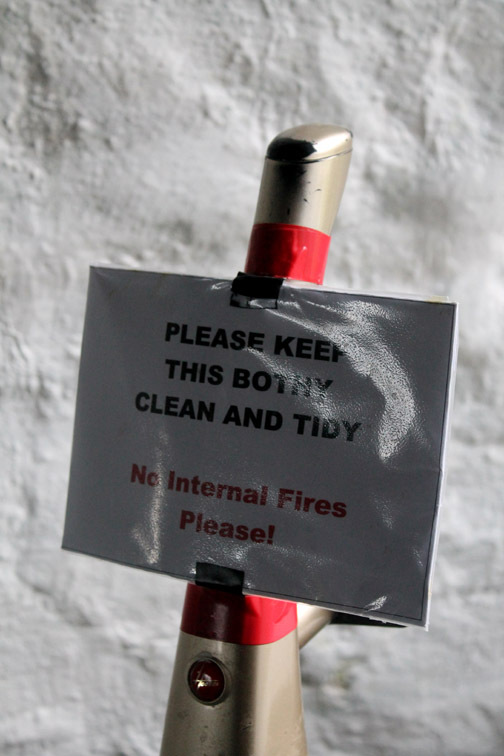 The point is made in a humorous way . . .
. . . keep the place clean and tidy please. 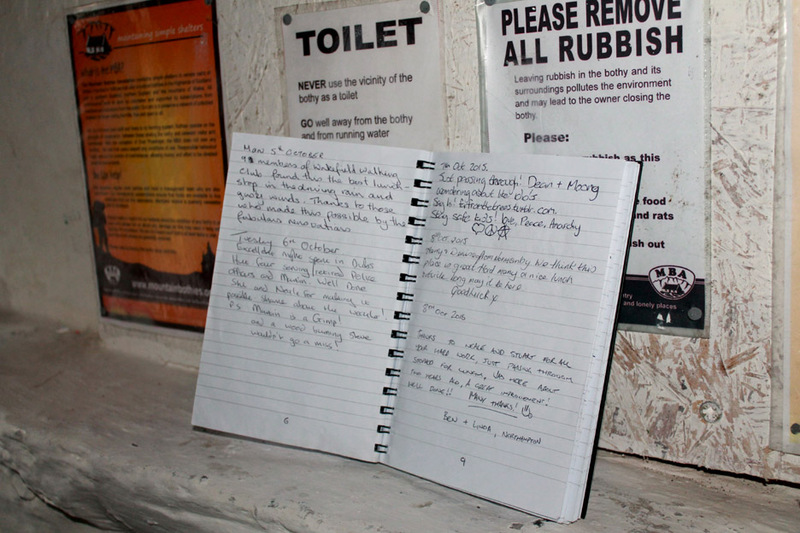 There's a new guest book on the mantle piece. 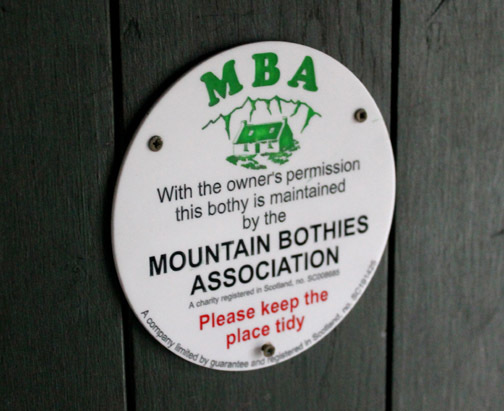 It is really good to see the bothy having a new lease of life . . . long may it continue. 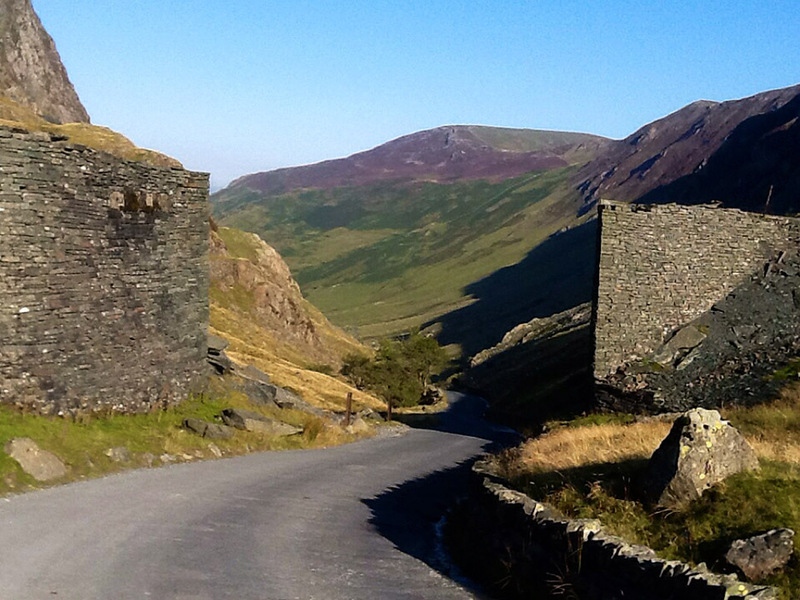 Our route back to Honister started along the old dram road, the old rail track across the fellside. 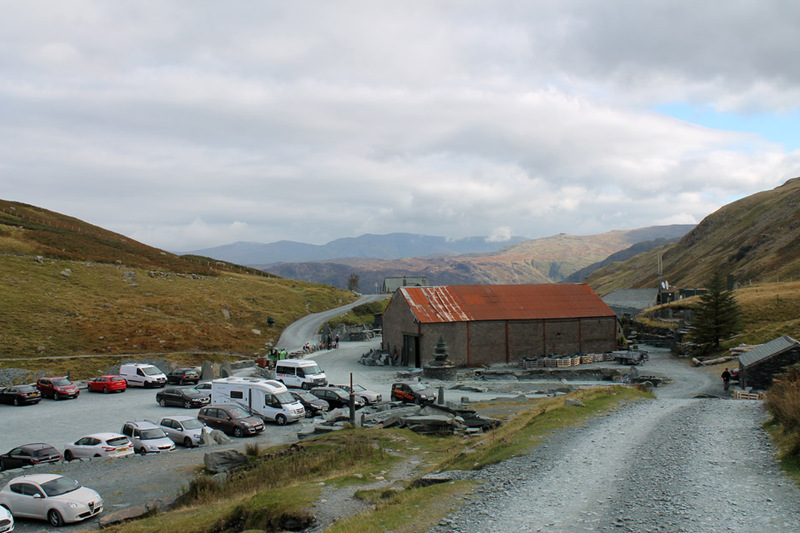 to the summit and then down to the mine buildings. that needed heavier machining in the sheds below. 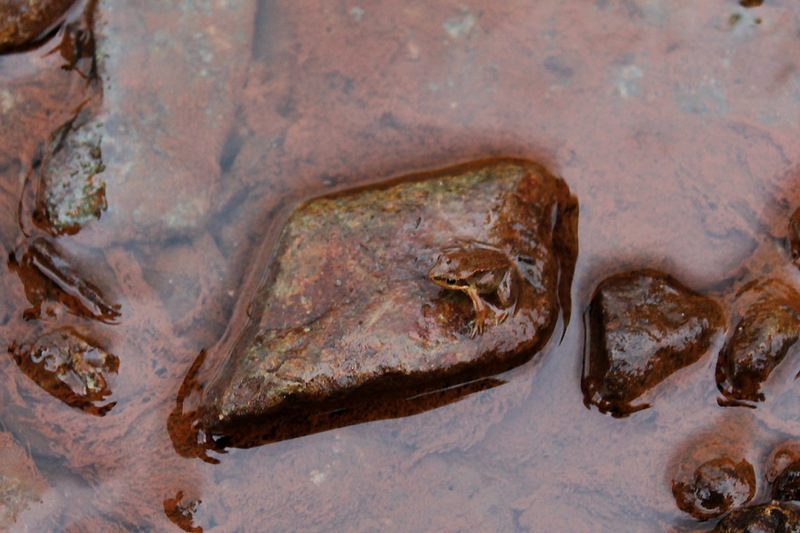 beautifully camouflaged on the stone. 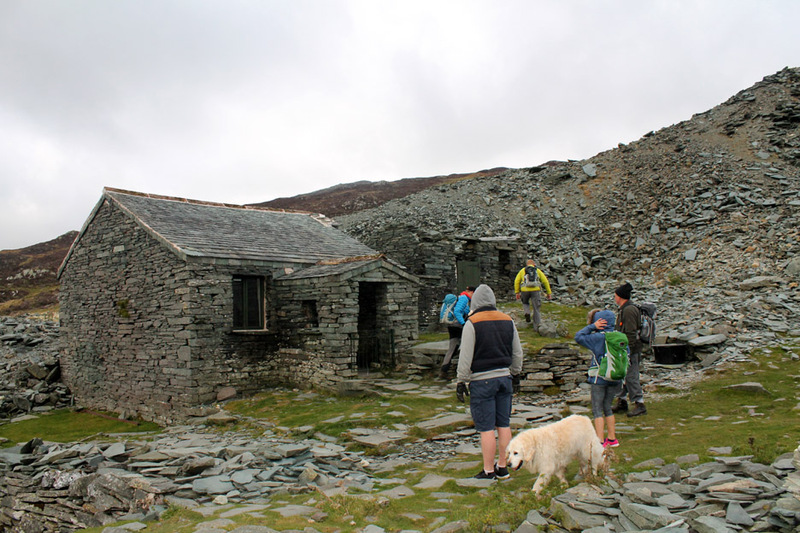 The summit of the track crossed the old "Drum House" though the machinery is long gone. Down the other side . . . the path swings left at the fence. 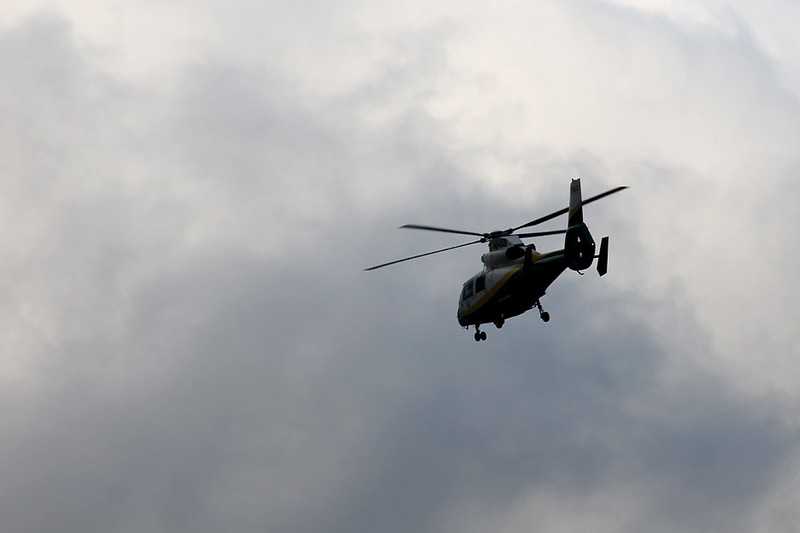 As we turn a helicopter flies overhead. 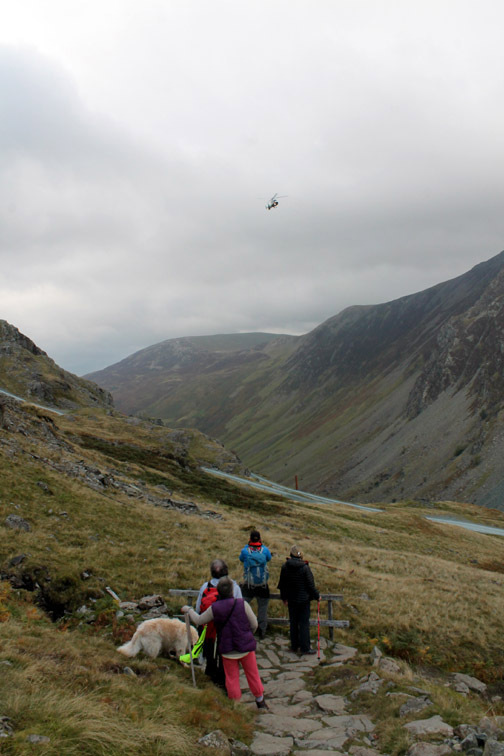 The Air Ambulance is out to assist Mountain Rescue with an incident of some sort. 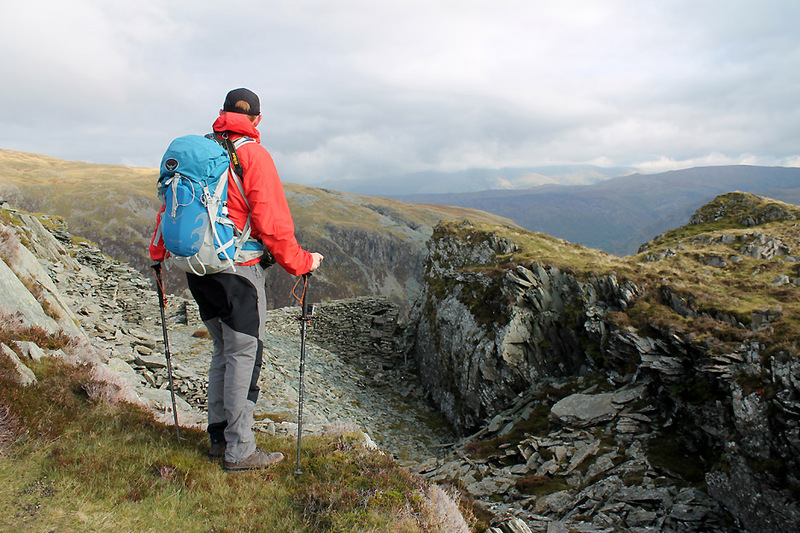 It lands lower down on the Borrowdale side of the pass, out of sight from where we are standing. The newly repaired path takes us down to . 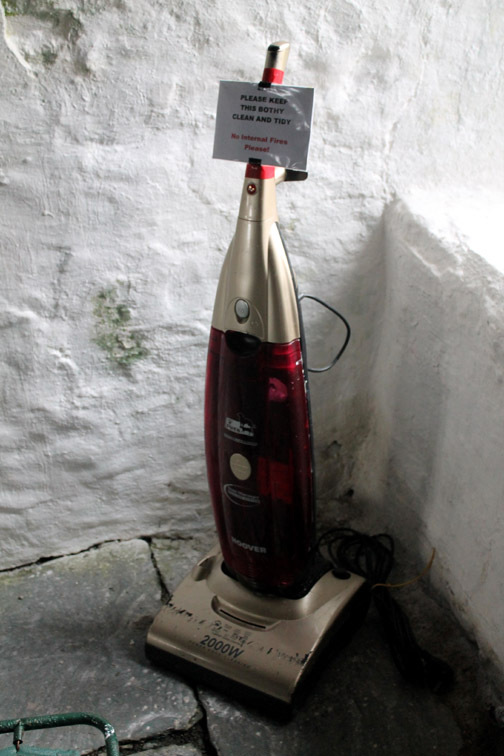 . .
Ambleside ? . . . Don't panic . . . it's just a model. by Edward Robinson of the Lakeland Miniature Village at Flookborough. 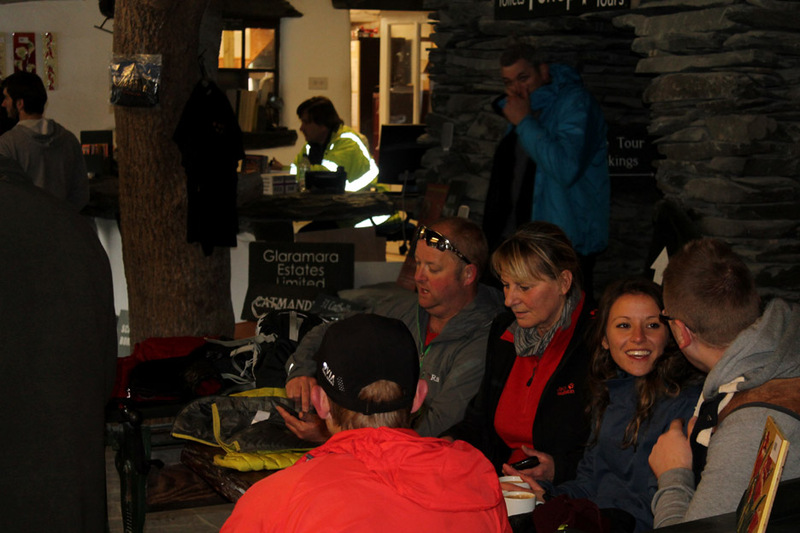 To end the day we head inside for a warm drink in the Honister Sky High Cafe. Harry and Dylan take a rest . . . suitably close to the tables for any spare biscuits that may fall. 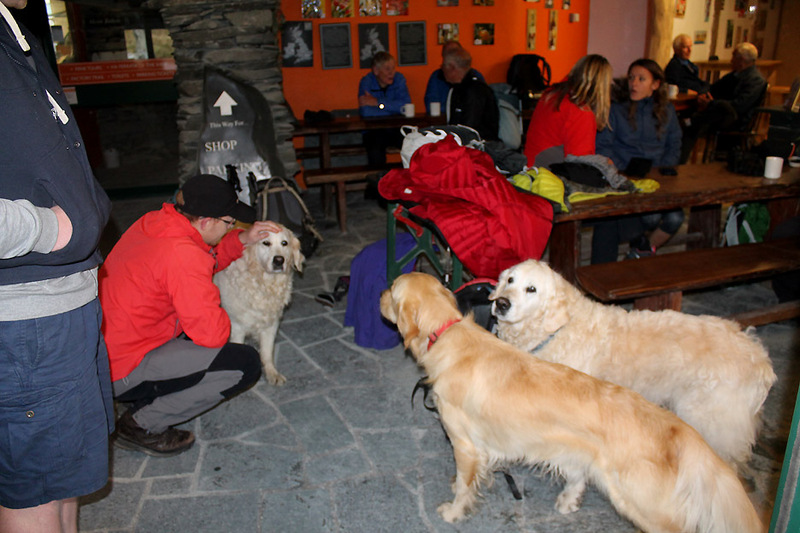 They get up to greet Honister's resident old lady . . . Bella . 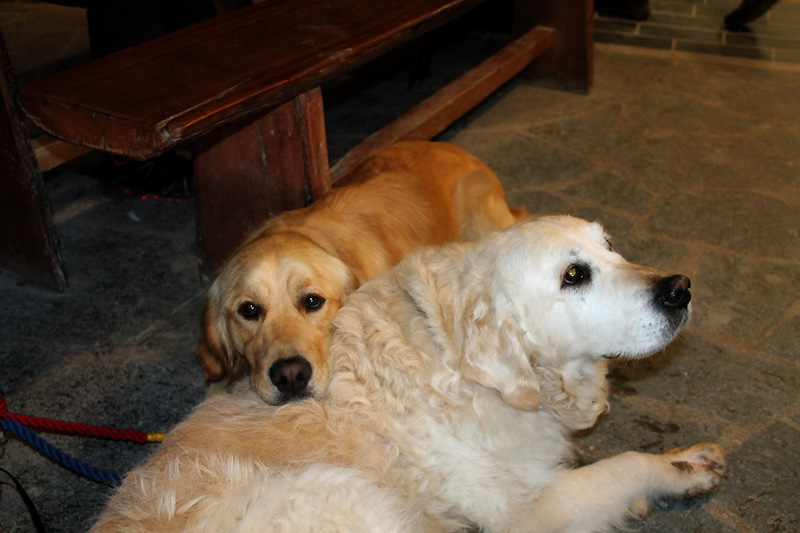 . . another golden retriever and a real Harry look-alike. 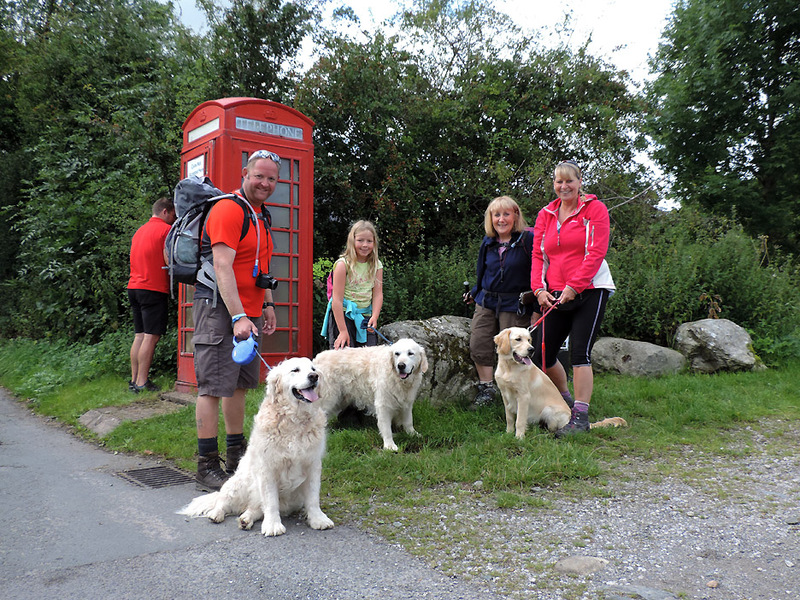 Last time we walked with Mark and Gill we were joined by their dog Neeni. Unfortunately she was not well enough to join us on the walk today. Since then we learn that Neeni was very ill and she ended her life quietly at home a few days later. We post this picture of Neeni in appreciation of a fine dog . . . we only met her a few times but she was much loved and will be sadly missed. This site best viewed with . . . great memories of a great day.